Mucin 5AC glycoprotein (MUC5AC) is a HMW glycoprotein belonging to the superfamily of mucins. Mucin 5AC glycoprotein (MUC5AC) is a HMW glycoprotein belonging to the superfamily of mucins. Mucins are produced by epithelial cells and can be divided into two families; secretory mucins and membrane bound mucins. MUC5AC is a mucus-forming, secreted mucin that is found in normal gastric and tracheo-bronchial mucosa, but absent from normal colon. 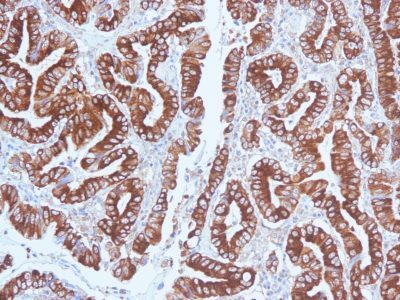 MUC5AC expression is present in primary ovarian mucinous cancer but usually absent in colorectal adenocarcinoma, thus showing an expression pattern opposite to MUC2. Together with a panel of antibodies, Anti-MUC5AC may be useful for differential identification of primary mucinous ovarian tumors from colon adenocarcinoma metastatic to the ovary. MUC5AC antibodies may also be useful for identification of intestinal metaplasia as well as in the identification of pancreatic carcinoma and pre-cancerous changes vs. normal pancreas. 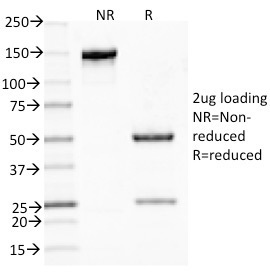 Catalog number key for antibody number 0897, Anti-Mucin 5AC (CLH2) The prefix indicates conjugation, followed by the antibody number and size suffix.